I’ve known about this film for a few months now, but only now viewed the trailer. It looks amazing!! What a whirlwind the weekend was – travelling travelling travelling, saying farewells, icky farewells. I hate airport goodbyes. Sure the hellos there are wonderful and loud and so full of expectation, but the goodbyes just drag. When it comes to saying goodbye to friends and family at airports I wish I could be cryogenically stored and just pass through the whole procedure without consciousness. Ugh. Anyway Monday was a strange day of being back at work and back into routine. Generally you get back into routine far too quickly and the holiday is just a blur and a dozen awesome memories. But Monday turned out to be better than expected. Back to work, fairly cruisey, new office, lots of welcome backs and then the anticipation of the concert in the evening. I caught up with a friend before the concert down at Southbank at the Stokehouse. Was nice too. Relaxed, city views, warm temperatures, cool drinks, great burgers and chips. Delicious. Although they forgot our order and I started to stress about getting to the venue in time. So we scoffed the burgers. Mmmmm big steak burgers before a Morrissey gig? Irony? N didn’t have a ticket yet, but whilst in line to buy one he got stopped by a scalper and offered a ticket for less than half price. Score! It was in GA however so we bid farewell and I caught up with the girls in my seated section. I was pretty glad to be hob-nobbing it with the more mature guests in the seats, but once Morrissey arrived on stage I was having second thoughts. I would have liked to have been closer to that man! During the performance I fell in love with him. Seriously that voice. It’s perfect. His demeanour on stage is so elegant. The way he flicks the microphone lead, and his sudden movements, the arch of his back, it’s all so fluid. But mainly it was his diction, and the poetry of his words. I could understand everything he sang. I love that. Highlights included – “You’re the one for me, Fatty”, “Everyday is like Sunday”, “How Soon is Now?”. And then out of nowhere it seemed, while he was inspecting a donation from the audience he launched into “Please, Please, Please Let Me Get What I Want”. Oh Morrissey, I swooned. Towards the end of his set he reached out and pulled a few people onto the stage to cuddle him. The security staff – both on stage and on the ground were incredibly quick to grab them after they had their second with Morrissey and practically threw them off the stage! It was pretty hilarious to watch. My friend S told about a friends wedding she went to years ago in Spain where the Groom sang the Bride “You’re The One for Me, Fatty”. Brilliant! Most of the family were only Spanish speakers so didn’t get it, luckily. Conclusion: I’m so glad I went. I was umming and ahhing over my decision for some time but I loved every second of it (maybe not the animal cruelty video that was played during “Meat is Murder”, yes I eat meat, no I hate animal cruelty) and wished he would keep on singing all night long! 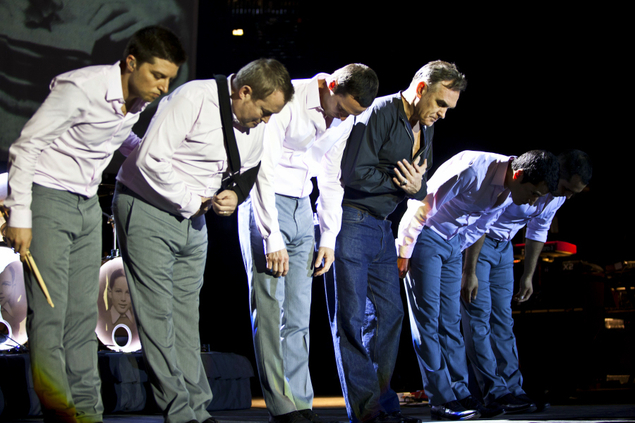 Note to Morrissey: please keep your shirt on! You’re not 25 anymore. For more on the excellent gig take a look at this review. I’m just back from WA and preparing myself for getting back into routine once more. 😦 Oh but it must be done. More on WA later. But firstly, tomorrow night is Morrissey at the Convention Centre with three lovely friends. Unpredictable, depressive, wonderful Morrissey. I wonder how it will all go down?